I bought Scene of the Crime, a writer's guide to crime-scene investigations by Anne Wingate, Ph.D. at the same time as I bought Modus Operandi so the information, whilst still relevant, much is more relevant to pre 1996 crime scene investigations. That said, this is an excellent companion to that book. Where as Modus Operandi gives you an overview of types of criminals, Scene of the Crime goes into the specifics of how police work a crime scene. Anne Wingate is a retired detective and author of crime novels. Much of this book is based on her personal experience of crime scenes and not only includes anecdotes from her professional career but also includes a specific, real case as a framework for the step by step process of investigating a crime. It is a fascinating read covering everything, from what happens when a crime is first reported, how a crime scene is recorded, how evidence is collected, what evidence can be found, how evidence is processed and what can be concluded from the results. If the crime involves a body it covers what happens to the body, what evidence can be obtained from a body, how a body decomposes and the progressive difficulties of what a body can reveal the more it has decomposed. There's extensive chapters on fingerprinting including the administrative issues that went along with matching fingerprints to perpetrators before such things as computer databases. It's quite surprising to learn that cases that collect finger print evidence, prior to computerization, weren't guaranteed to be matched even if the guilty person's fingerprints were on file simply because of the logistics of searching physical card records. You'll also find a good overview of firearms and the evidence that can be collected from them. How autopsies work and how crime labs work. Along the way you'll get some idea of how long evidence takes to be processed and discover some of the administrative issues that can slow down an investigation. Anne even points out procedural issues that could be exploited in your own crime writing. The final chapter covers unofficial investigators (a popular focus for fiction). Unfortunately, in the real world things look pretty bleak for their ability to function as they don't have any authority or access to crime scenes once the police step in. That said, the author notes there are ways around this but generally it's not easy to present a realistic portrayal without giving them a few lucky breaks. Every chapter includes a table summary of the topic you've just read making this an excellent reference book to go back to and find what you need to brush up on fairly easily. Included in the Appendix is sample reports from people who worked the crime scene and reports from the crime lab of what was found in the evidence processed. 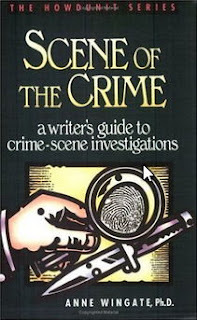 There is enough information in this book to write a fairly convincing crime story but the author does warn that crime scene investigation is a constantly evolving field. For example this book was written around 1992 when DNA sampling was a relatively new field. Twenty plus years on I'm pretty sure you're going to need updated information if you want to make that a convincing part of your story. Anne gives you some suggestion on who to call in your local police force if you want to get updated information on most areas of evidence analysis. If you're writing a crime story that needs to be fairly convincing then this book will mostly have you covered. Unless your crime hangs on a specific area of evidence analysis where you need to be extremely factual you probably won't need to do too much further research. I know I've watched many high profile crime shows that don't get anywhere near as detailed as this book with their crime scene investigations. I highly recommend this book, even for modern stories, as so much is still very relevant to today's police work.